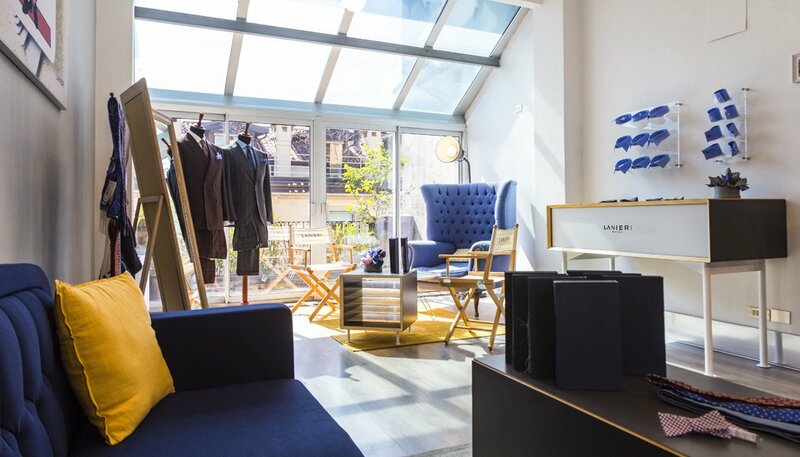 For over one hundred years it has been the most elegant dinner suit in every man's wardrobe. 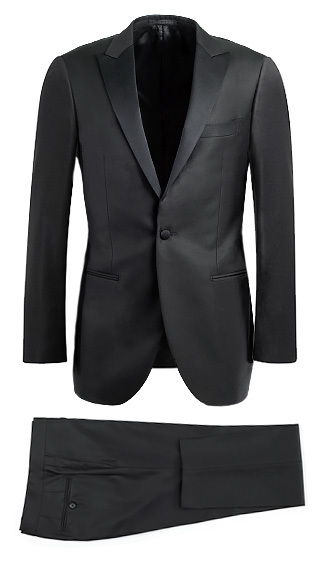 Also called dinner jacket, a custom tuxedo is a stylish master key for the most exclusive black-tie events. Inspired by the nineteenth century smoking jacket, an overgarment designed to be worn while smoking tobacco or for domestic leisure, the tuxedo replaced the tailcoat as epitome of elegance and sophistication. The golden rule? Avoid black tie if the event or wedding is held before 6 pm. The original and most formal model of tuxedo jacket is the ventless single-breasted model. Unlike regular suits it has only one button which allows the front to be cut in a deep “V” shape that mimics the ideal male torso and emphasizes your shoulder width. A classic silhouette and defined form. Main features of any tuxedo, peaked lapel and shawl collar are equally authentic and correct. What to choose? The peaked lapel is derived from tailcoat and for that reason it is considered the more formal of the two styles. Its upward and outward shape emphasizes height and shoulder width. The shawl collar, on the other hand, is influenced by the smoking jacket and conveys a softer image than its angular counterpart. The jacket’s sleeves should be finished with four or three kissing buttons, just like the sleeves on the tailcoat and better business suits. All of the jacket’s buttons are covered in the lapel’s facing, for an extra touch of elegance. Classic or contemporary? Choose the style you want. In keeping with black-tie tradition, our tuxedo trousers can be customised with or without the iconic satin or twill stripe down the outer seam of the legs. Avoid belt loops and cuffs or pleats. Simply wear trousers that take braces, belts are no good when you’re going for a formal look. An essential cut as required by etiquette. Designed for tuxedos, especially tailored for you. 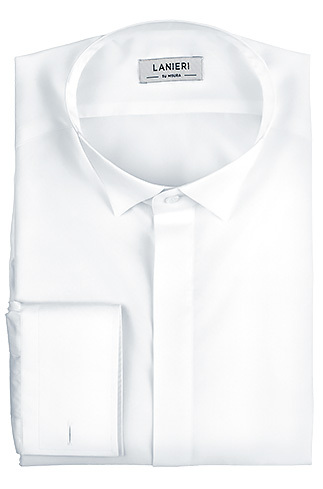 Shirts are white and either have a winged collar, which is designed for bowties. The essential detail to complete your black-tie attire. The winged collar is our most formal collar style. It is designed to be worn with a silk bow tie under a tuxedo for white or black tie events. Placket can be covered or you can opt for a contrasting choice with thicker 4 mm black buttons. A tuxedo shirt requires single or double French cuffs, and obviously cufflinks. Standard and rounded French cuffs are both appropriate. There's a reason why black-tie is called black-tie. In fact a black bowtie is the perfect finishing touch to a formal ensemble. The other essential accessories are cufflinks and a white cotton or coloured silk pocket square. If you are looking for something a bit retro you may also cover your waist with a band, called cummerbund. What about socks? Choose black knee-high socks and match them with black patent leather oxfords, plain or cap-toe. NOTE: We suggest you start planning two months in advance. We will tailor your tuxedo in 3/4 weeks and, if necessary, we will have time to make changes.